Valiant Living means living life to the fullest. We offer a variety of residential services to help make that happen! 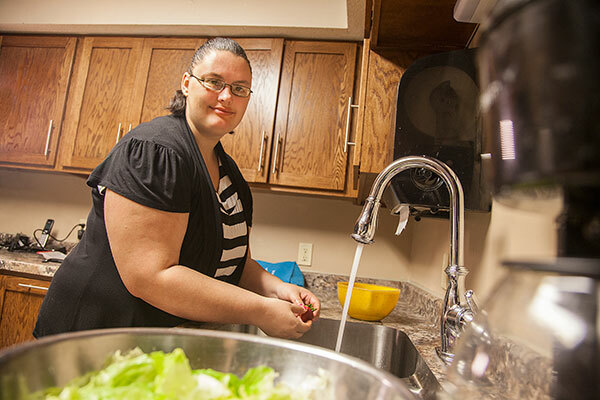 Level One – Valiant Living provides 24 hour staff support in homes throughout the community of Madison. In this setting, people benefit from socialization with others and shared living experiences, while enjoying private bedrooms. Assistance is provided with meal preparation, personal care, laundry, social activities, communication, medication management, therapy/exercise, and other services as needed. Level Two – Some people choose to live in their own home setting, but also need or desire staff support present in the same building where they live. Valiant Living provides training to enhance skills for independent living, such as cooking, cleaning, safety, personal care, communication, and help with medication management to help people achieve their goals. Valiant Living assists people on an “as needed” or “as scheduled” basis within their own homes. These services may be provided several times throughout a day, or once or twice a month, depending on the individual service plans developed for independent living success. To learn more about Valiant Living’s housing options please call (605) 256-6628.